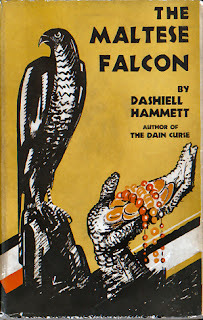 Leading up to a 75th anniversary theatrical viewing of The Maltese Falcon, I've been re-watching Huston's classic adaption and re-reading Hammett's novel. It remains a favorite, though I see through different eyes now that I'm about the age of Spade's ill-fated partner, Miles Archer, than I did when I read and watched it repeatedly as a bookish pre-teen who had just discovered film noir and the novels of Hammett and Chandler. Huston's adaptation hews so close to the novel that even the changed scenes and omitted characters could barely be said to haunt the movie as ghosts. Among the changes: we don't see Gutman's daughter; Spade's lawyer gets relegated to a single phone call; Effie doesn't call Cairo "a queer," and his handkerchiefs are said to smell of gardenias rather than the less recognizable chypre; we meet one hotel detective, instead of two; Spade doesn't force O'Shaughnessy to prove she didn't steal the thousand dollar bill that Gutman palmed. The changes are competent; they don't leave holes in the story or gaps we tend to notice. We don't see Spade take a meal in the movie, but the movie wouldn't have been improved by us watching him make a liverwurst sandwich. The one scene in the novel that doesn't make it in Huston's film that I would include, if I were to produce a new adaptation, is Spade telling O'Shaugnessy Flitcraft's story. It's a decidedly odd story, in and of itself, and it's even odder for it to be in The Maltese Falcon. While easy to see why the decision was made not to include it in the film for the very reason we can easily imagine the novel without it, I think we need to bear down and ask why it's there. Hammett wrote Spade as a man who spoke judiciously, a man who liked to talk, but wasn't a prattler. There's certainly a reason the Flitcraft story makes the cut. 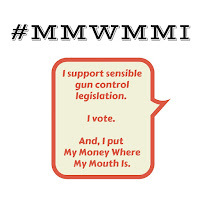 Can we make sense of it? Hammett scholars will have no doubt covered this ground, and I'll circle back check my hypothesis against what more accomplished critics will have already had to say on the matter, but it seems to me that the story of a man whose perception of his life is blown open by a near-miss falling beam while walking past a construction site has something to say about Spade's love of Brigid O'Shaughnessy. Flitcraft walks away from his life, his family, internalizes the randomness of our existence, then eventually drifts back into a life that mirrors the one he lead before his satori and period of wandering. Beams stopped falling near him and he stopped living as if they did. Spade has, by meeting O'Shaughnessy, found himself similarly having his reality shattered. He's in love with a woman he knows is lying to him, using him the way she's used other men as protectors for as long as she's needed them, one he finally recognizes as a cold-blooded killer. She's a beam that's fallen directly in his path. And he is very nearly ready to throw away his life and the terms by which he's lived it, to live a new one with her. She's shown him a glimpse of himself he's never seen and he's shaken to the core by her. Brigid is merely puzzled by the story, and it never comes up again in the novel. Yet, when Spade tries to explain himself to her, to explain why he's going to turn her over the police, the Flitcraft story underscores the scene. He could upend his life, he could shield her from the law and carry on in a new way. He wants to. But won't. He refuses to be a Flitcraft. She's a capricious force of nature he won't bend his will to. His anguish is that he's seen what Flitcraft saw, but he's not going to let it change him.